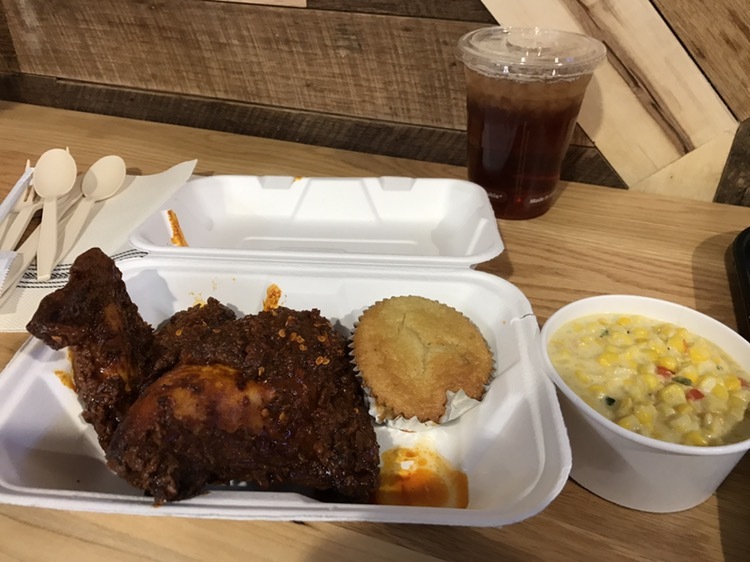 Recently, someone mentioned a “hot chicken” place had opened in Krog Street Market and I was on it like, well, hot sauce on chicken. 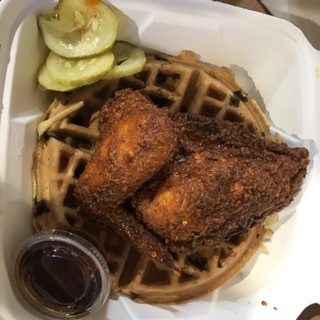 I couldn’t work out the right time to get to Richard’s Southern Fried, which is from chef Todd Richards (executive chef at White Oak Kitchen & Cocktails), for a while, but today the stars aligned for us to be in the Old 4th Ward around lunch and we found a parking space. Classic is well-seasoned without heat – a delicious option for anyone! Hot introduces you to the slow-burn heat that is the hallmark of the Richards’ Southern Fried spice mix. My beloved ordered the chicken and waffles. Today’s waffle was pumpkin, so that set the mood for fall. She really enjoyed the waffle and ordered her chicken “Hot”, which was an overstatement. It was slightly spicy, but with no serious burn. To get their chicken the way the want, they marinate the chicken in a spiced brine for 24-48 hours (depending on the size of the bird), then air dried, before pressure-frying it – to get a crispy, crunchy skin that is not heavy. I ordered a breast and wing, “Richard’s hot”, with a side of mac-n-cheese. This was good (kind of) hot chicken, but the highest heat level here only hits medium at a good Nashville hot chicken place. The skin was crisp and the chicken underneath was moist. The corn had jalapenos in it and had almost as much heat as the chicken. The corn muffin, as opposed to traditional white bread, was a pleasant surprise and just slightly sweet.